I've generally been keeping an eye (and ear) out for simple science based podcasting applications and have particularly enjoyed the sort of outputs that the BBC News online produce. I'm not talking about their high end productions but their simple use of audio, usually reinforced with images. Although most would agree that good use of descriptive audio can stand alone - we can all still learn a lot from radio broadcasting techniques - think of the plays or shows with narrators setting the scene before the characters talk... 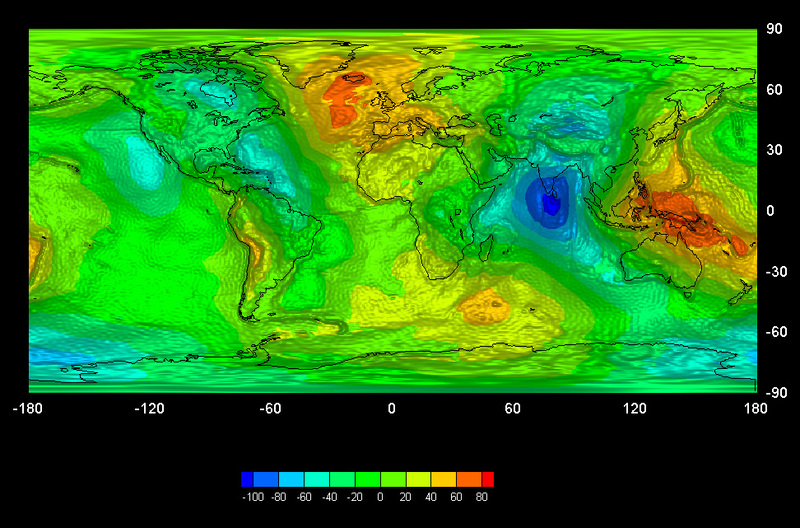 If I may point you to this recent BBC News article on Earth's gravity. I'm being a little bias, as this was a topic I remember well from my geology classes. Did you know that earth's gravity varies across the earth surface? Those of you from disciplines that link to environmental/geological studies will of no doubt know this as the Bouguer anomalies. I digress... Notably this articles page includes a very simple podcast from Professor Reiner Rummel, explaining the gravity map (see GRAVITY - A MOVING TARGET) OK its not called a podcast on the page, but it has all the characteristic. Essentially a typical BBC interview asking questions combined with the images. I cannot stress how simple and effective short bites of audio are for enhancing learning. Why bother? Well the beauty of using audio (only) is that it's easy to do and students are able to carry these snapshots of knowledge with them. A simple application could be an image on our tulip ('MS Sharepoint') and a link to the audio (held on iTunes U or our new UpMedia system), would you not agree this could be effective? Enjoy being creative with your favourite subject matter. Image courtesy of ESA - GOCE High Level Processing Facility.